Like most adults, I hadn’t ridden a bike in years. 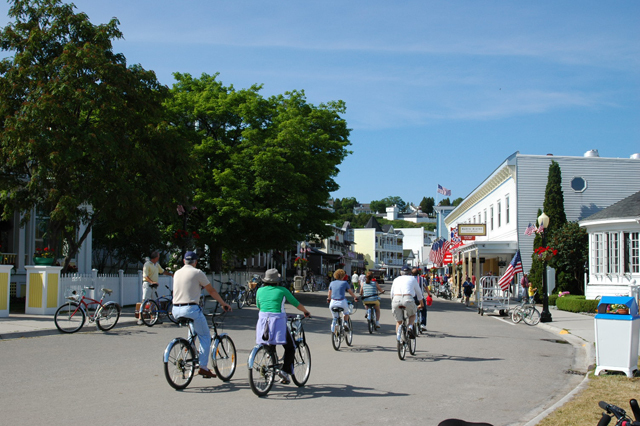 During a vacation to Mackinac Island in 2006, I rented a beach cruiser and took an eight mile ride around the perimeter of this “car free” getaway. After returning home, I researched bikes and selected an Electra Townie 7D. Not an electric bike, the “Electra Bicycle Company” is the manufacturer of this hybrid / comfort bicycle. I took it out for a spin now and then around the neighborhood; but unfortunately the bike stayed in the garage most of the time. In January, 2010 I received some news that was rather unsettling. I was informed that a tremor that in my left hand had been diagnosed as a symptom of Parkinson’s disease. It only seemed logical to make an effort to improve my level of fitness, so I began spending a bit more time on my bike. That was fun until I smacked my shoulder into a steel guard rail while attempting to make a sharp turn onto a narrow bridge. I told my neurologist about the accident and also shared the fact that narrow sidewalks made me uncomfortable. He recommended limiting my cycling to a stationary bike in a gym. I immediately dismissed that advice and simply used more caution during my rides. 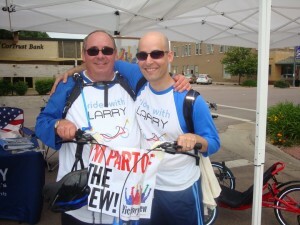 In November, 2010 I enrolled in a Cycling Savvy class. 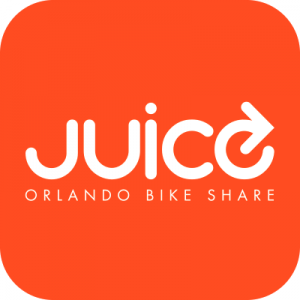 The twelve hour program consisted of four hours of classroom training which emphasized the best ways to avoid hazards, followed the next morning with bike handling skills training, and finished with a four hour riding tour of Orlando. We rode a total of 25 miles that day, much further than I had ever traveled on a bike. That class equipped me with the skills and confidence to ride whenever and wherever I chose. I applied those skills by taking part in group rides, personal trail rides, and began to rent bikes in cities around the country while on business trips. 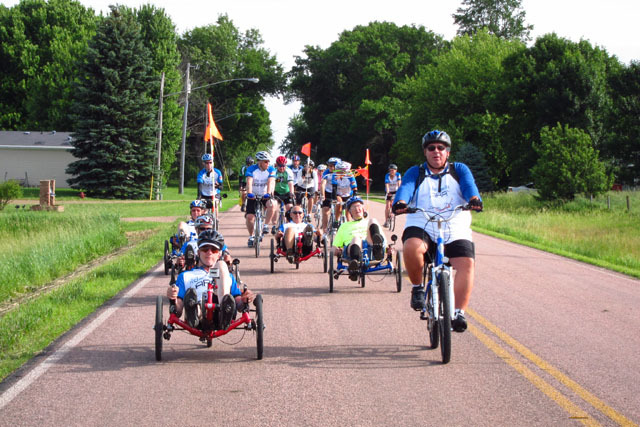 A major sponsor of the “Ride with Larry” was the Davis Phinney Foundation, founded by Olympic Medalist and Tour de France stage winner, Davis Phinney. He was diagnosed with Early Onset Parkinson’s when he was just 40 years old. His Foundation supports research to find a cure, but also provides information for people living with Parkinson’s on “how to live well today.” I became part of their “Victory Crew” and have raised close to $ 5,000 this year to support the cause. I slacked off a bit in July and August, but then made the decision to set a personal goal of riding 1,000 miles before the anniversary of the Cycling Savvy class. With two weeks remaining, I was up to 875 miles and just had 125 miles to go. It was doable, but would require dedication. I mentioned my plan to Charles Badger, a Cycling Savvy Instructor. He offered to help me reach my goal by joining me on two rides during the final week. By the way, Charles was the ultra-distance rider I mentioned earlier. We met at the AAA headquarters on Sunday (11/6/11). 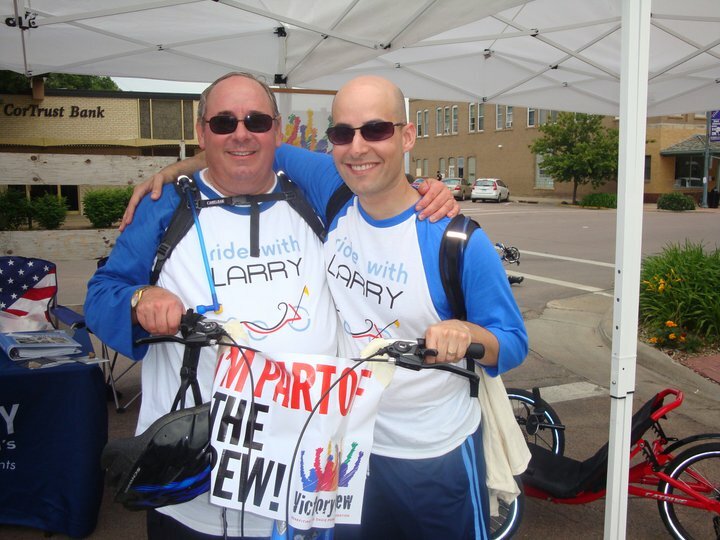 We would be accompanying riders from a company Charles knew. He went over the route and asked me to take the lead. He would follow behind and “shepherd our flock”. Being asked to “Lead the Dance” was a big honor and even a larger responsibility. The phrase was coined by Keri Caffrey, Founder of Cycling Savvy, and is best understood through this video as a way to ride with confidence. 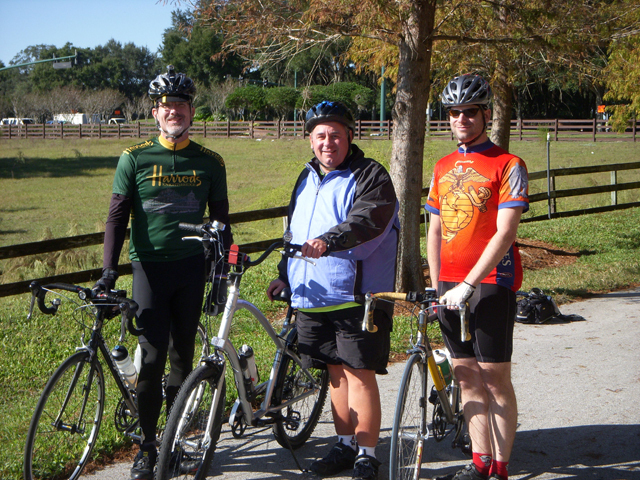 Our group of 25 riders consisted of representatives from a finance company, their clients, family and friends. I noticed that two of the ladies were riding bikes similar to mine.. When I asked them about their bikes; they acknowledged that they “hadn’t taken them out of the garage in more than a year.” This was going to be a long day for them, but they did well throughout the ride. We started along International Parkway. I quickly discovered that a disadvantage of “riding point” was contending with headwinds and carving a path through the wind for the rest of the riders. We seemed to be riding directly into the wind much of the day. However, we had a pleasant tailwind as we rode along the south side of Lake Monroe. We made our way through the town of Sanford. It was a beautiful day. Much of our 30 mile ride was through back country roads and everyone appreciated the scenery and the opportunity to converse with one another. I started a mini stampede when I rang my bell as we passed a pasture full of horses. All in all, it was a good way to spend time together and support a good cause. During the midpoint rest stop, I saw Michael Cottle, owner of OutSpoken Bikes – the shop where I had purchased my bike. He was surprised to see me leading the group on my Townie. Many cycling friends have recommended that I “move up” to a road bike, but for now the current transportation has been a great ride and served me well for many miles. I love my bike! At the last stop, Charles asked me to explain the chalk drawings that he had made on the pavement describing how to handle the remaining interchanges. It was gratifying to share my cycling knowledge with the group. I also thanked them for helping me move closer to my goal and shared the fact that I had Parkinson’s disease, explaining the benefits of cycling as therapy for Parkinson’s patients. After navigating the Country Club Road, Lake Mary Blvd. 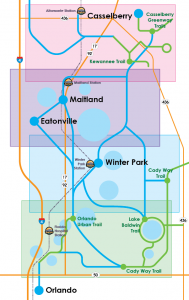 and Reinhardt Road sections, we finally approached the bicycle / pedestrian bridge over I-4. Charles rode up next to me and I admitted, “I got nothing left for the bridge”. My new mentor immediately shot back some words of encouragement which was just what I needed. I executed the first turn onto the ramp by going down to my second gear, but the 180 degree turn was too much, so I dismounted and let the group pass. 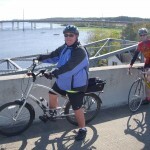 I admit to “walking” my bike up to the apex of the bridge, but sailed off the downside ramp at about 20 mph and rejoined the group at the point where they had gathered and was met with a round of applause from “my peeps”. I resumed my spot up front and brought the herd back to the starting point. We were each given a medal upon our return. 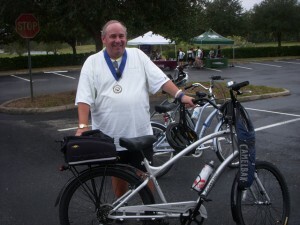 Later I realized that it read “Century Ride,” recognition for completing the 100 mile route. I’m all for being honest, but rationalizing that I would soon be reaching my goal of the equivalent of “Ten Centuries” so I proudly placed the medal around my neck. Charles showed up Friday morning at the meeting spot behind the Peach Valley Cafe. He was accompanied by a co-worker, Ryan Warner, who was wearing a U.S. Marines Corp logo on his jersey. It was very fitting to be doing this ride on Veteran’s Day (11/11/11) with a veteran. Ryan, thank you for your service to our country! I only needed 18.42 miles to reach the goal. Charles had mapped out a 35 mile route. We again passed the AAA building as we rode up International Parkway. However, we quickly encountered 16 mph winds which slowed our progress. 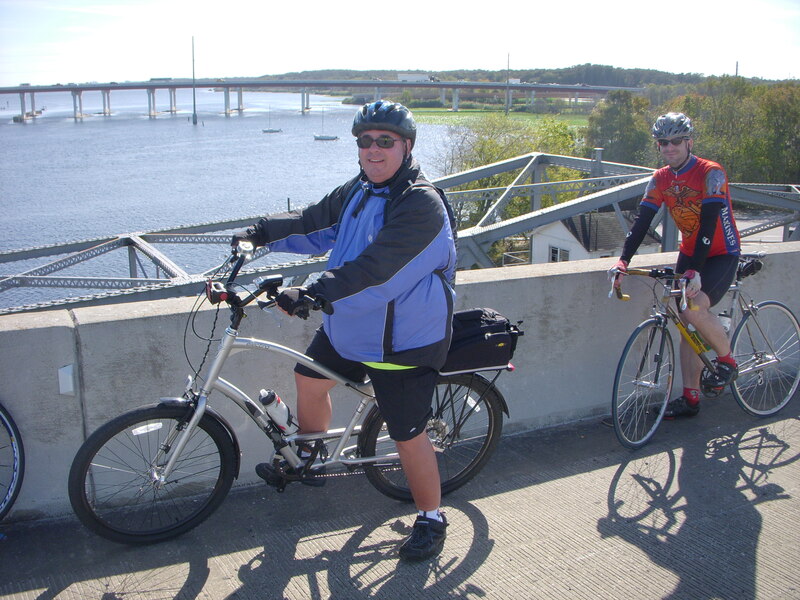 When we reached 17-92, we crossed the Old St. John’s River Bridge. Halfway up the ascent I elected to walk my bike to avoid pulling a muscle. Charles and Ryan waited patiently at the top. We took a moment to catch our breath and pose for a few photos with the I-4 Bridge in the background. We turned onto the Spring to Spring Trail. It wound through a tree-lined path providing protection from the wind. Ryan saw a wild pig and Charles pointed out several deer in one meadow. Along the way we took in views of Lake Monroe with the mid-morning sunlight dancing off the waves. I began calling out the countdown as we completed each remaining mile. My companions allowed me to ride alone up front to savor the moment. Five, four, three, two ….. With one mile to go, we passed a house with an American flag flying proudly in the wind. My countdown became “tenths:” and then we were there. 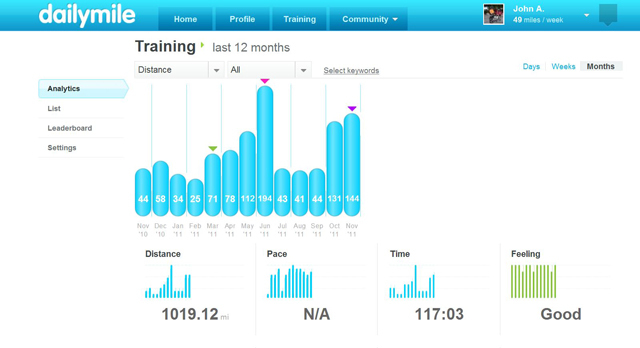 Goal accomplished – 1,000 miles in one year! Davis Phinney would celebrate every cycling victory by sitting up in the saddle and raising his arms into a “V” for victory. One of his Foundation’s mottos is “Every Victory Counts”. Achieving my goal was indeed a victory for which I am very proud. 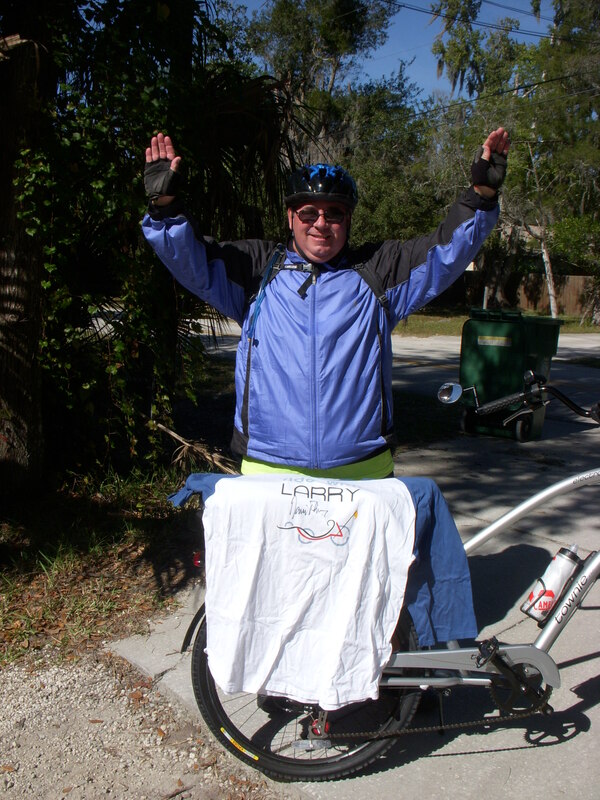 It was a pleasure to raise my arms up in celebration and to be photographed with my “Ride with Larry” shirt, which Davis Phinney had personally autographed for me at the Grand Rapids Victory Summit. Reaching this personal goal didn’t earn me a medal or have any significant meaning in the grand scheme of things. It did, however, prove to me that I can take on challenges and work steadily towards achieving them. I don’t know how Parkinson’s will affect me over time, but I am doing my best to fight back. The goal was personal, but achieving it was a “team victory” due in large part to a tremendous amount of support, encouragement, and love that I’ve received from family, friends, and complete strangers. We resumed our ride and savored the beautiful fall day, smooth pavement, and the satisfaction that comes from “crossing the finish line”. After winding around the east side of Lake Monroe, we headed west along Lake Mary Blvd. back towards our starting point. 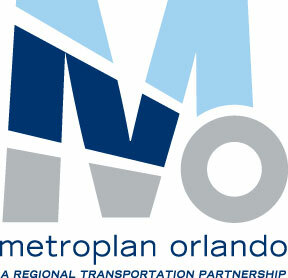 The final “feature” of the day was crossing the I-4 interchange on Lake Mary Blvd. It was a fitting way to complete our “Victory Lap.” That major interchange once was a major obstacle for me. 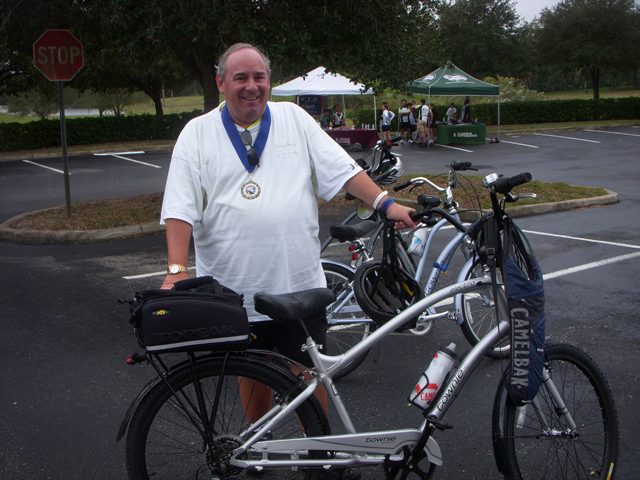 Two weeks after completing the Cycling Savvy class last year, I navigated it for the first time. Keri Caffrey coached me through it and video-taped the original ride. These 1,000 miles were made up of many small victories along the way. I plan to continue to cycle as long as I can. Some of the future miles may be difficult, but they will all be a source of joy. Great accomplishment John! I’ve enjoyed reading about your journey towards this milestone. Keep logging the miles. Here’s to your next 1,000! Congratulations, John! I look forward to riding some of your next 1000 miles with you. 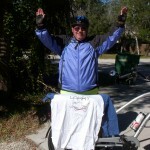 John, congradtulations on your 1,000 mile goal!! Like Diana, I hope to ride some of the next 1,000 miles with you as we had talked about before!! I just need to get off my b*** and get going!!! Where did I learn to spell!! Tis the Season, Let’s Ride! A Great New Connection!